Porsche loves harkening back to the past. Almost anyone who claims to be into fast metal will be familiar with the blue, red, and white livery that has graced countless championship winning race cars. However, there’s one manufacturer the Italian drinks company will forever be tied to: Porsche. Martini Racing is responsible for sponsoring some of the most iconic Porsche works racecars, including the 1968 Porsche 907, the 1971 917K that brought Porsche its second 24 Hours of Le Mans crown, and countless racing versions of the 911 RSR. Martini has become so ingrained in the German automaker’s motorsport culture that the company has even been known to offer some of its road cars in those stripes. A few years ago in Europe, both the 911 and the 918 were both offered with the ultra rare Martini Racing Edition package, but now Porsche is offering the Martini decal pack for all 911 models. The package includes Martini stripes that run the length of the car, from the frunk, up and over the roof, then back down the rear deck. Another set adorns the side sills. There’s a big logo splashed across the hood to create a classic looking livery which looks home on almost any Porsche. Aero kit cars even receive spoiler decals. Offered through , the Martini Racing Design decal set can be ordered for a wide variety of 911 variants including the entire Carrera family, Turbo S, . GT2 cars are excluded, as are Targas, Cabriolets, or anything equipped with a sunroof. You could also go full on nerd and opt for the matching Martinti branded indoor car cover, which Porsche makes from breathable, antistatic and dirt-repellent material. 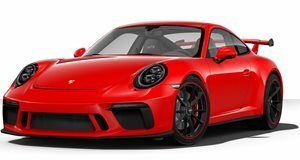 Porsche didn't say if it will restrict graphics application by paint color, but they’re German so we’re going to assume they might not let buyers match green with blue and red Martini stripes. White, black, or silver paint may be the only options.